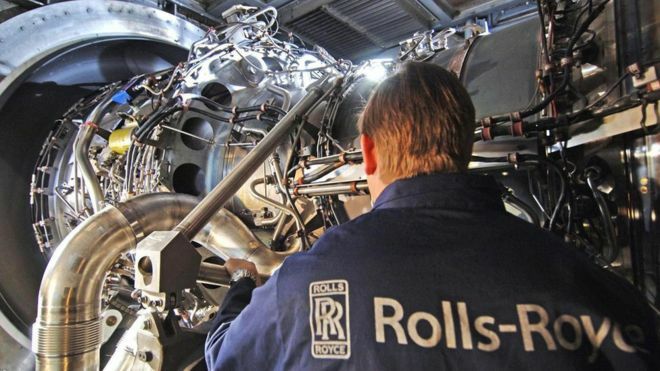 Rolls-Royce has raised its cost-saving targets in a bid to cut between £150m and £200m from its budget. The aero engine maker said the savings would be at the top end of its target amid a challenging period ahead. The company said demand for its engines for extra wide body aircraft had stayed strong. However, Rolls was losing ground in business aviation, while problems in offshore oil and gas markets meant its marine orders were “very weak”. In a trading update, the group maintained its outlook for lower revenues as well as profits this year. Chief executive Warren East said: “We have made steady progress in 2016 to date, delivering a ramp up in large engine production and implementing the first stage of our transformation programme. The group will switch to a new accounting method in 2018. George Salmon, equity analyst at Hargreaves Lansdown, said that would result in last year’s profits being restated and adjusted down by £900m. “Five profit warnings in the 20 months up to November 2015 means Rolls-Royce shareholders have had anything but a smooth ride recently,” he said. Shares slid 2.7% to 734p, making it one of the biggest fallers on the FTSE 100.